Total scores on the AAQ-II showed a statistically significant increase, t (50) = 5.51, p < .05, which indicates greater psychological flexibility post programme. An effect size (d) of .77, indicates a medium effect size. Pre and Post mean scores on the AAQ-II were similar to those reported in previous years. 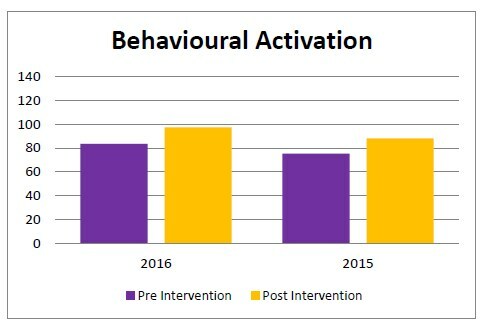 Mean BADS scores increased significantly from (M = 83.57, SD =23.28) to (M = 97.18, SD = 22.75) indicating greater behavioural activation, t (50) = 3.80, p < .05, representing a medium effect size (d = .59). The percentage of those completing the programme with scores below 70 (the mean reported by Kanter et al. (2009) for a sample with elevated depressive symptoms) reduced from 37.7% to 11.8% at the post measurement time point. 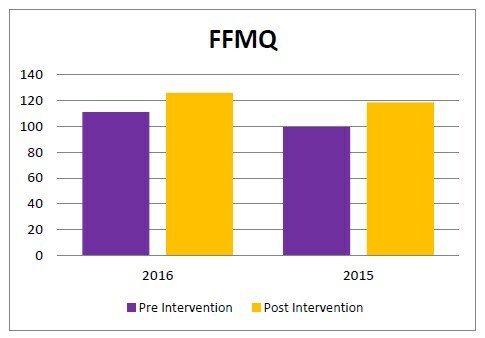 Total FFMQ scores increased significantly, t (46) = 6.20, p < .05, from pre (M = 110.89, SD = 20.20) to post (M =125.77, SD = 20.33) indicating greater levels of overall mindfulness, with a medium effect size observed (Cohen’s d =.73). Mindfulness is defined in this context as; observing, describing, acting with awareness, non-reactivity to inner experience, and non-judging of inner experience. The scores on both pre and post means are within the range which indicates significant functional impairment but post scores are closer to 10 (scores below which are associated with sub-clinical samples). 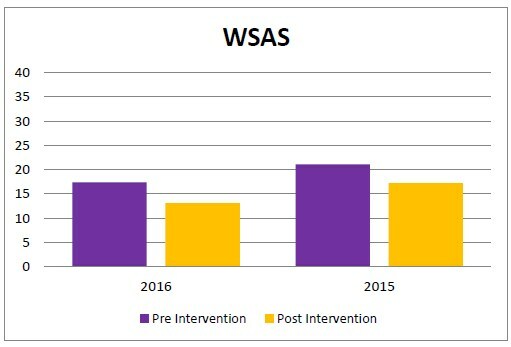 In this sample 20% of those who completed the programme had scores below 10 when they started the programme, while 35.3% had scores below 10 on completion of the programme. 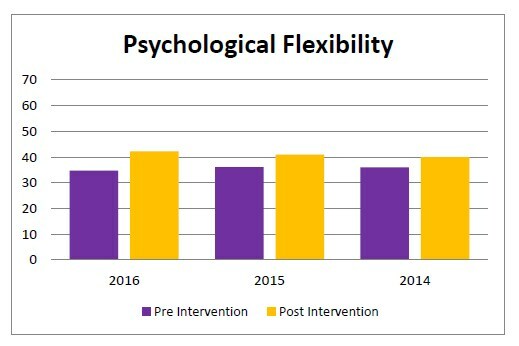 These findings are in line with the 2015 and 2014 outcomes reports that indicated significantly greater behavioural activation, greater levels of mindfulness and less functional impairment. 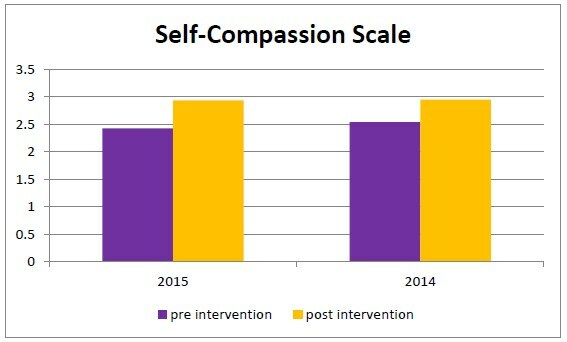 Total SCS scores increased significantly, t (47) = 3.09, p < .05, from pre (M = 2.47, SD = .61) to post (M = 2.73, SD = .67) indicating higher overall levels of self-compassion post intervention. A small effect size was observed (Cohen’s d = .40). Self-compassion is measured in six domains; Self-Kindness, Self-Judgement, Humanity, Isolation, Mindfulness and identification or “Over-Identification” with thoughts.